A single stem florescence must maintain balance. 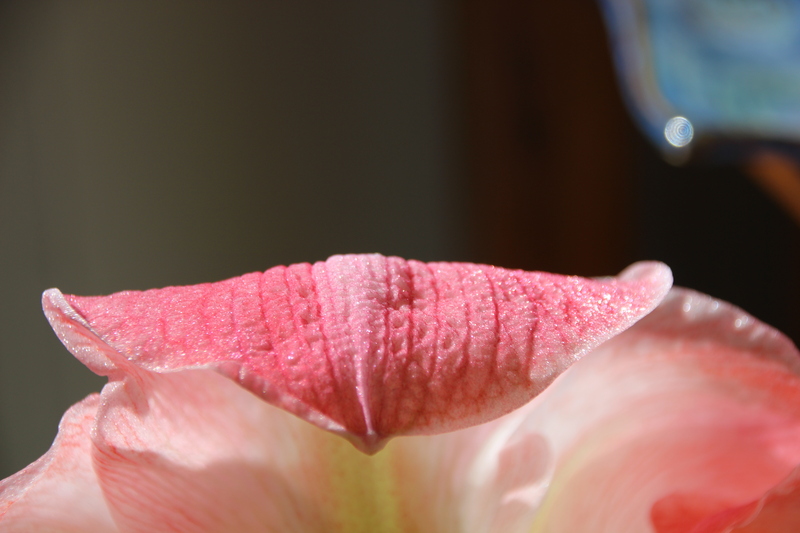 It does this by dancing very slowly around the stem. 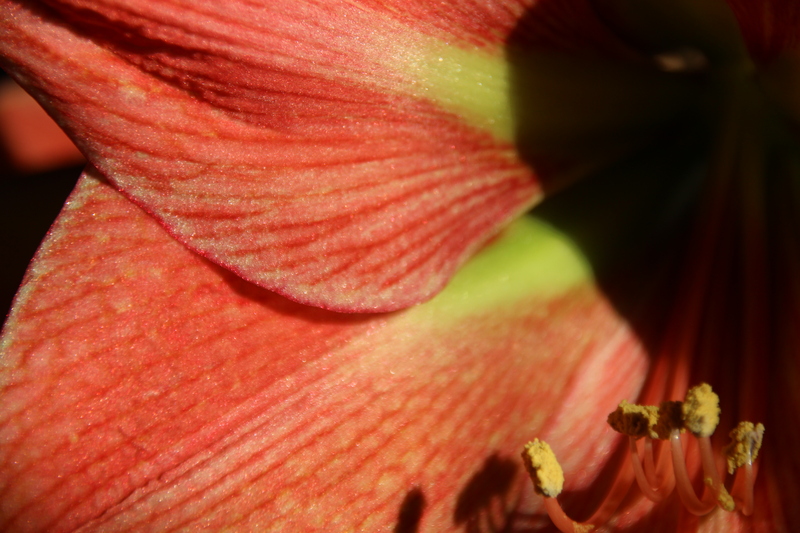 Symmetry must be maintained as the flowers bloom. The round dance is called circumnutation. 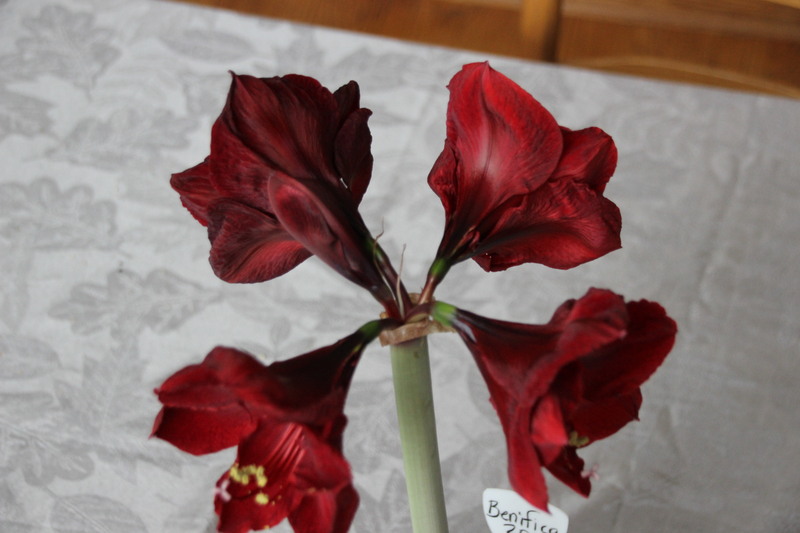 I have been watching my Benfica Amaryllis dance this week. There is an odd number of blooms. The last one to open is days behind the others and smaller. I have observed this last bud slowly spinning above its sisters. 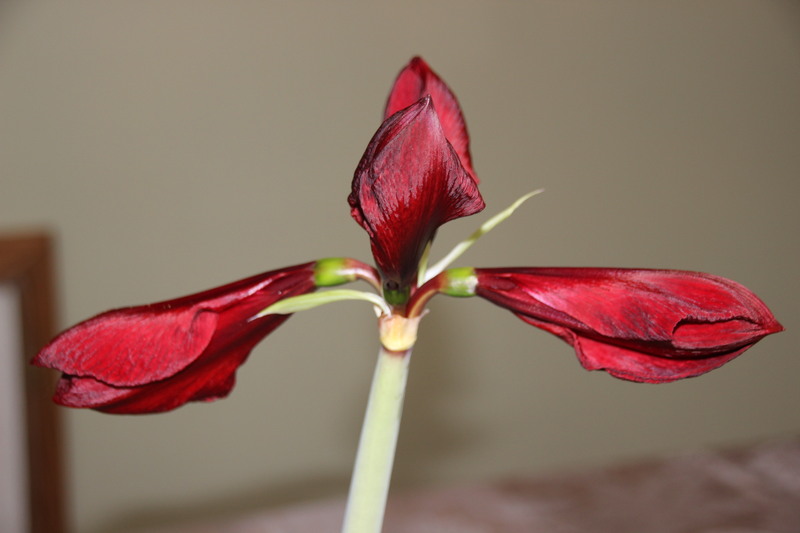 It has finally settled down close to the oldest bloom which is beginning to wither. Taking up the space that is being vacated. We can learn from our green relatives if we pay close attention. 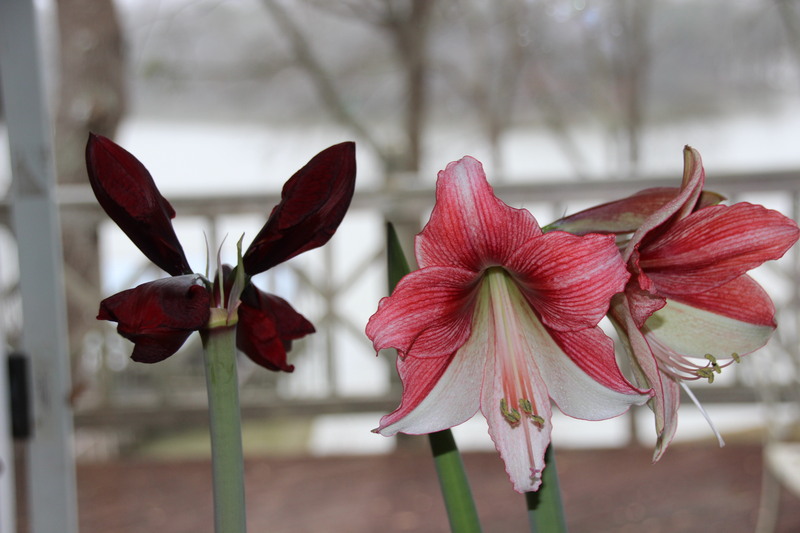 Each winter I order at least one new variety of Amaryllis. This year I ordered two. 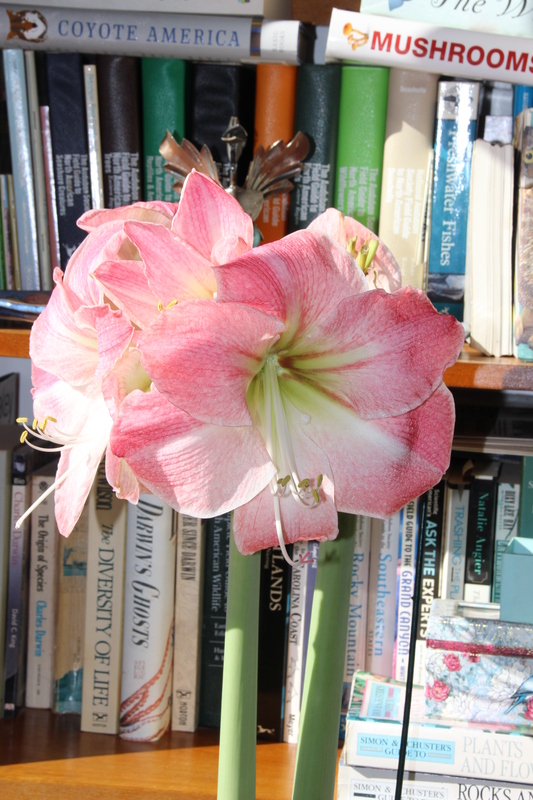 Half-and-half is still blooming and has sent up a second stalk. Benfica is making me wait. Its buds are dreamy red velvet. 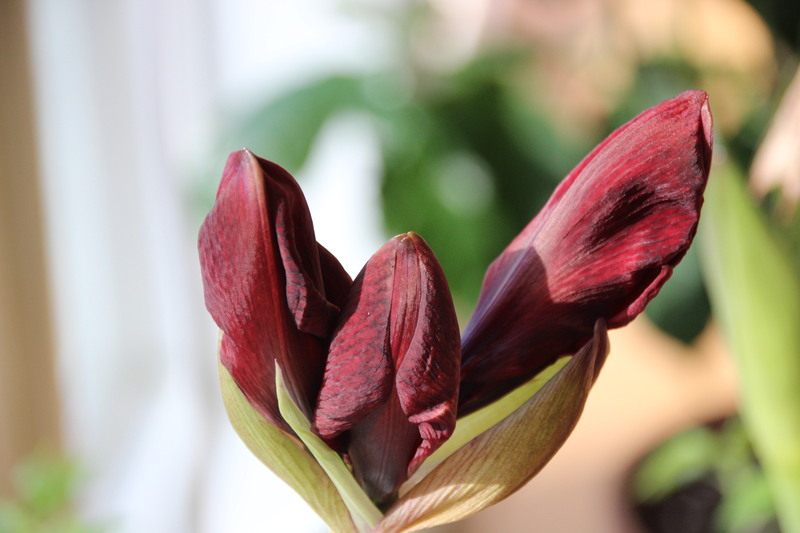 Every day there is slow progress toward blooming. I will be happy when I finally see the faces of its flowers. Until then, I am enjoying the anticipation. 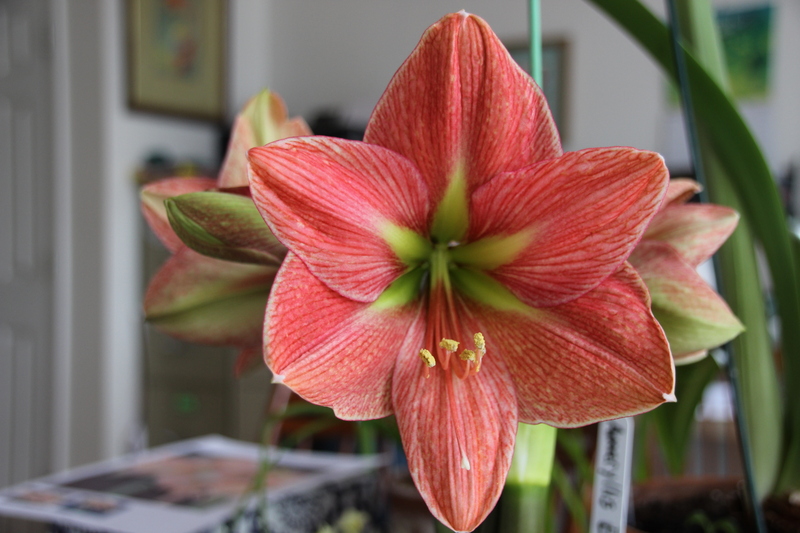 in the 2019 Amaryllis Race. Benfica lagged behind from the start. A beauty contest will follow shortly. Will the late bloomer take that prize? 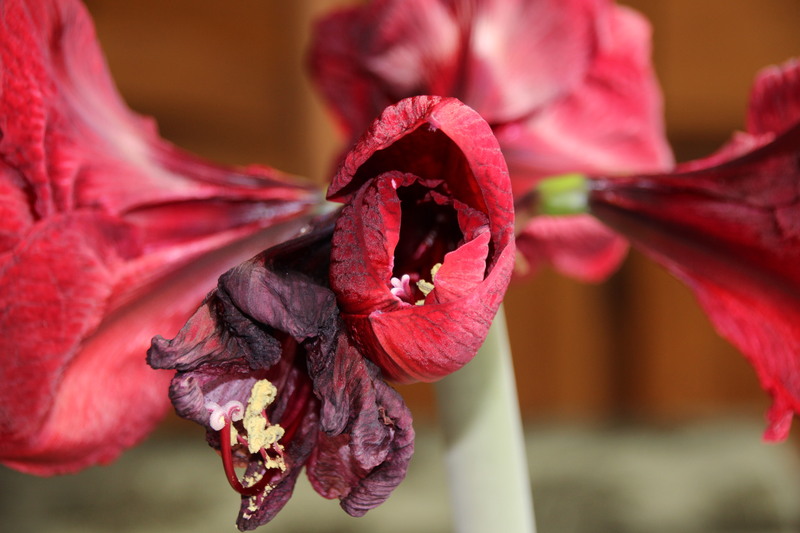 Don’t throw away these holiday flowers. 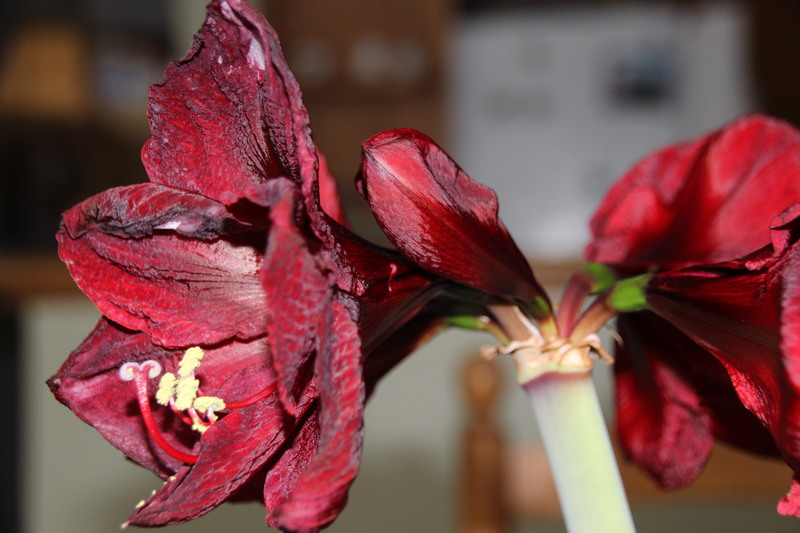 Save the Amaryllis/Hippeastrum bulbs until spring. Plant them outside in a sunny location with good drainage. Add compost to the hole and plant with the shoulders showing. They will bloom in May or June. Multiple stems with many flowers will show off for several weeks. Then cut the stems and leave the foliage. They will come back every year with more blooms. I do add a layer of mulch in late fall in case we have a cold winter here in Zone 7.
while waiting for the daylilies to take center stage in June. You can rescue them for 1/2 price or less in January. 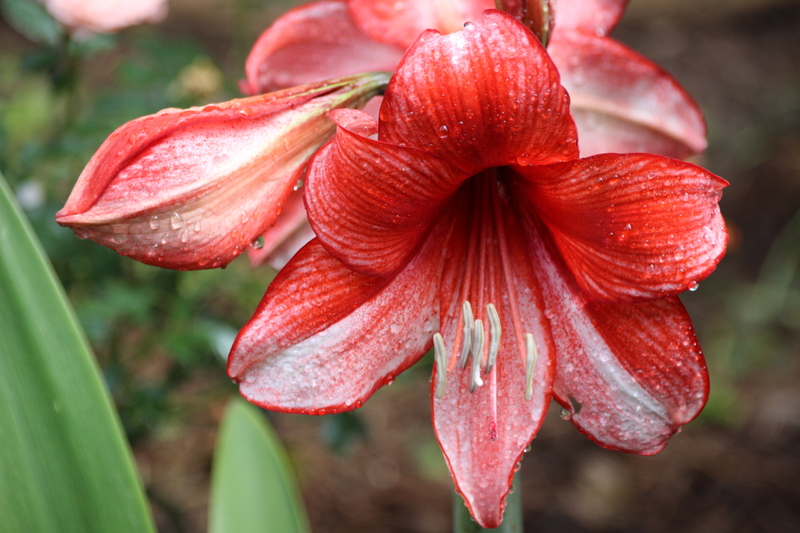 Every year, I add a new Amaryllis outside. 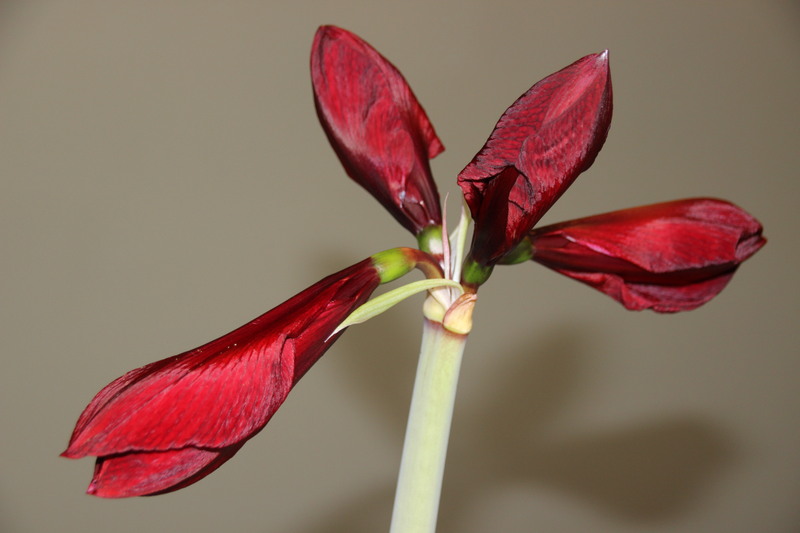 A good Amaryllis/Hippeastrum bulb will bloom twice. If you peek in the boxes from most “big box” stores the contents look like half a bulb because they split them. 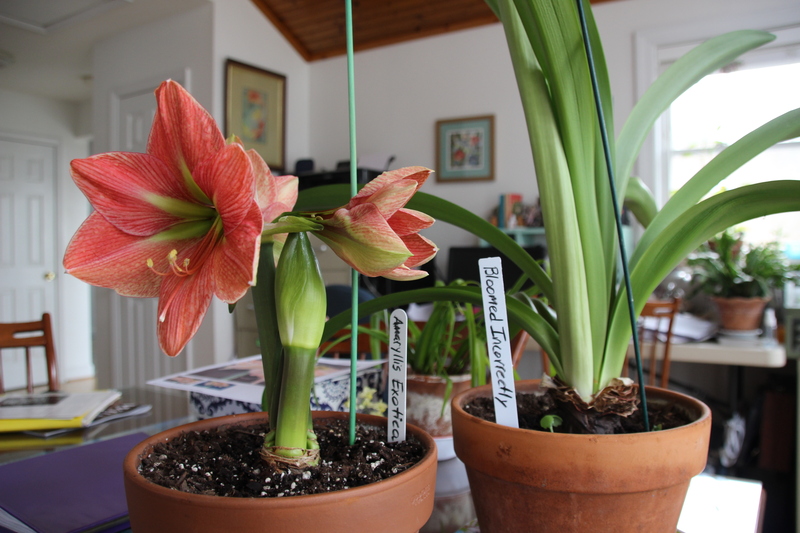 My replacement Exotica bulb sent up a stalk of the usual four blooms last month. 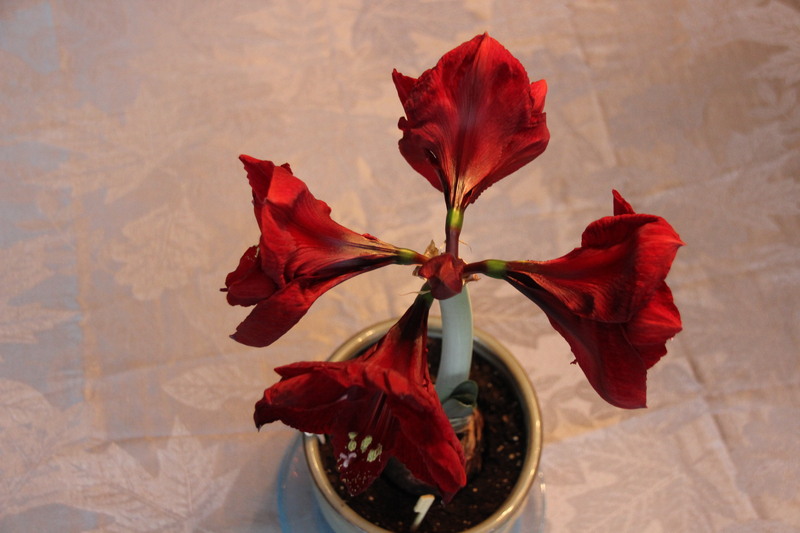 It has bloomed another time with six blooms on the second stalk. Really lovely colors, markings and shapes. 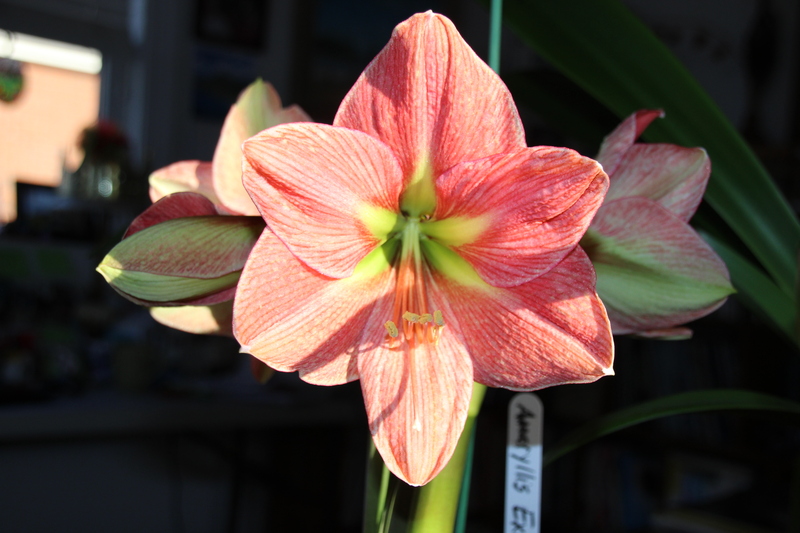 The replacement bulb for Amaryllis Exotica has bloomed. It has the expected color and striations. The apricot color definitely has a red shimmer in it. BLOOMED INCORRECTLY, from now on. They are both lovely. Both will be cared for, nurtured and loved. Though only one has a pedigree.